Suri Cruise and Tom Cruise reunited in New York. Tom Cruise is a lot of things. Doting father is one of them. Good Samaritan is another. So it's hardly surprising that he was reunited with daughter Suri in New York City just hours after she and Katie Holmes escaped uninjured from a fender-bender. Frankly, we'd be surprised if the knight in shining armor hadn't popped up in the Big Apple this morning to spend time with his 6-year-old for the first time since word of their split broke more than two weeks ago. MORE: Suri and Katie sideswiped! While getting caught by the paparazzi was inevitable, the 50-year-old movie star didn't stay out in public for too long, and was only briefly spotted while carrying Suri (herself carrying a stuffed animal) from his car to their hotel. He only arrived in the city this morning. 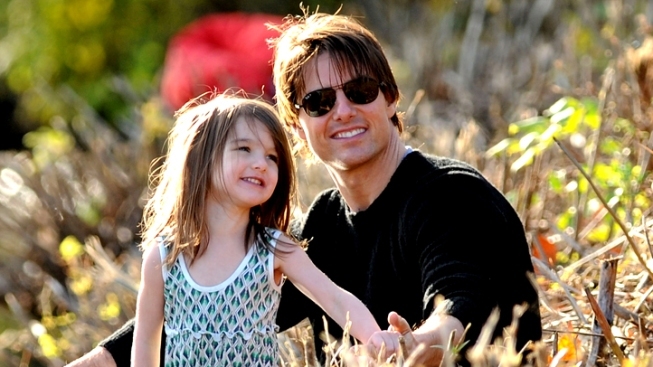 Though Suri and mama Katie have been making the rounds in NYC on a daily basis, Cruise has spent the past two weeks filming his new sci-fi flick Oblivion in California. From the adorable look of things, they've clearly missed each others' company.